Can you believe its November? My mom was right, the older I get the faster time goes. It seems like the air was on and it was hot out last I remember. Now, we had snow yesterday and its sunny today. Thanksgiving is just around the corner, and even if it is just my husband and I, you can bet, there will be a feast for 10 on my table. Hopefully it won't be long before our son will be able to join us for some holidays again and maybe more family and friends. Good for the soul to be with ones you love on the holidays. Sort of fills up your "soul tank". I admittedly am not a huge fan of dressing. I am a stuffing girl from way back. I am particularly a boxed stuffing fan. I know, I know! Some struggle with dressing or stuffing, do I stuff the bird or not? I will run down some basic rules if you plan on stuffing your bird, just in case you have forgotten or never really knew and have just luckily not given anyone at your feast any sort of food poisoning. First, make sure your stuffing has been chilled. When you put hot stuffing in a cold turkey, the results can be...umm.....pretty "crappy". Stuff your turkey loosely, do not pack the stuffing in so tight it can not achieve the temperature it needs, to be safe. The temperature of your stuffing should be 165 degrees. Inside the thigh of your turkey your temp should read 180 degrees. If your stuffing at that time does not read at least 165, it will need further cooking. As always wash your hands obviously before handling food and especially after handing any raw poultry. My mom always took the whole turkey off the bone before we ate so we never had that Cleaver kind of turkey carving ritual at the table, thus never having a stuffed bird. Now, in my older, young age, I have become semi- obsessed with individual portioned food. Maybe it is my freaky way of trying to control my own portion size, maybe its because my germaphobe husband is wearing off on me, maybe it is just FUN. 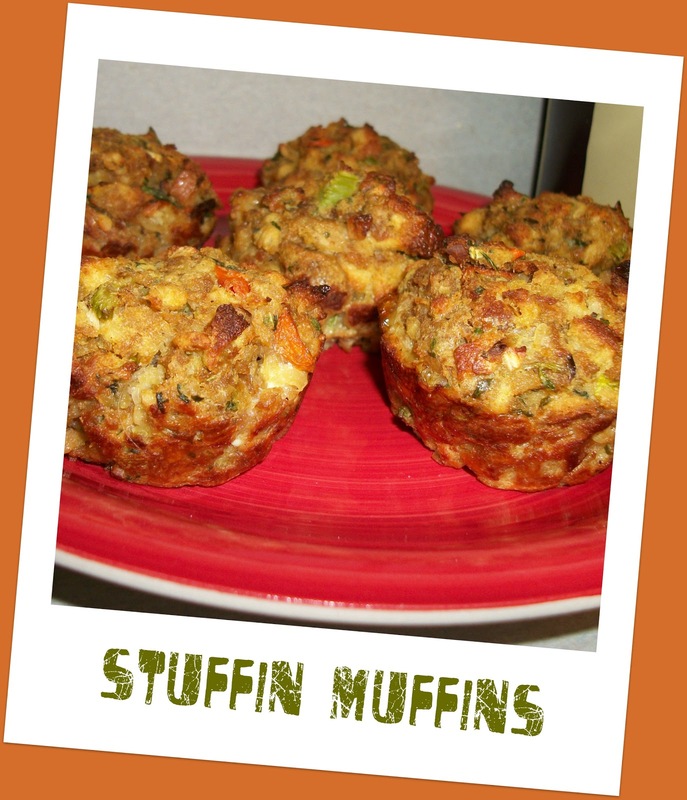 For the last 10 years or so I have been making "Stuffin' Muffins" Does everyone fight for the crusty, crispy edges of the stuffing at your house? And don't you like knowing you technically have the right amount of portions without guessing? I mean of course leftovers are a must at Thanksgiving but I guess I just like knowing for a fact I have plenty and if I make individual servings I know for sure! Anyway, everyone gets their own crispy tops and edges and they are fun! In my recipe I use a box of stuffing mix, yes I do, I admit it, I own and I LOVE it! So let's get going! Preheat oven to 350 degrees. Melt butter in saute pan, add in celery, carrots and onion, and cook for 2-3 minutes until tender. Add poultry seasoning and pepper. 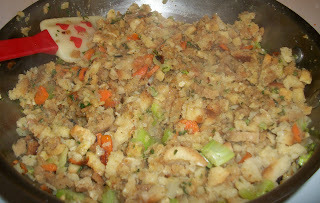 Now prepare stuffing according to box directions in the same pan. Combine everything thoroughly and let sit for 5 min. Transfer to a bowl and let cool completely in the refrigerator. When completely chilled, add egg and mix. Spray muffin tin with nonstick cooking spray and fill pan. This mixture should make 6 stuffin' muffins. Bake for 15-20 minutes. Let sit for 5 minutes. Run knife around the edges and carefully use a fork to slide down and under entire muffin to lift out. You will love these! You can add anything you like, browned ground sausage, bacon, or any other veggies you like. I am a firm believer that raisins and apples have no place in stuffing. Yuck! :) However if that is how you roll, go ahead, you are only limited by your own imagination! Hope you make Stuffin' Muffins a part of your Thanksgiving tradition!!! Awesome, a woman after my own heart! If you haven't joined the FB page yet, come on over! Lots of commenting and sharing goes on there since that is where most people are! I make home-made for holidays. I have a recipe from Martha Stewart...just plain old sage and onion dressing but it it to die for. I dry out my own bread instead of buying croutons. Delish! Love the idea. Make mine from the bags of stuffing croutons and then just add all my favs. One of which is apples but because they go so well with the fresh cranberries I use. Also a great way to freeze extra's and take out later. Thanks for fab idea.